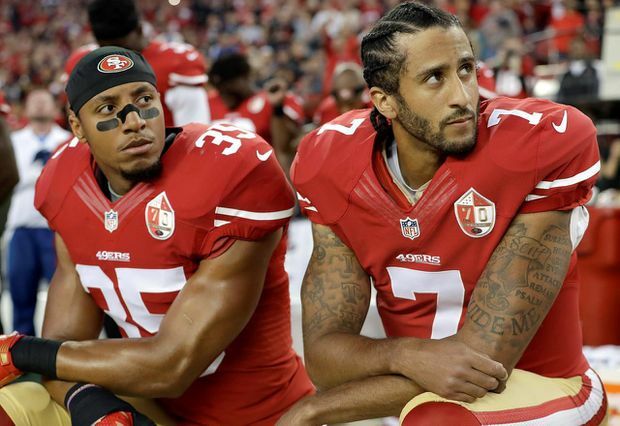 The league and Kaepernick’s lawyer sent out statements on Friday saying that “the parties have decided to resolve the pending grievances” and that a confidentiality agreement would prevent either side from commenting further. In this 2016 file photo, San Francisco 49ers safety Eric Reid and quarterback Colin Kaepernick kneel during the national anthem before an NFL football game. The protests slowed down this season, as the NFL made contributions to organizations chosen by players and promised more attention to social-justice issues. But the controversy reignited every time there was a development in the case. While the players seemed intent on pursuing the cases, the league might not have been eager for those deposed – including commissioner Roger Goodell and several owners and league executives – to appear. Still, for the players to prove collusion was a mighty challenge because, according to the 2011 labour agreement between the union and league, a “club, its employees or agents” must have “entered into an agreement” to limit contract offers. Kaepernick filed his grievance in August, 2017. Arbitrator Stephen B. Burbank sent it to trial, denying the league’s request to throw out the former 49ers quarterback’s claims. Burbank’s decision meant there was enough evidence of collusion to keep the grievances going. A wave of protests by NFL players began in 2016 after Kaepernick kneeled during the national anthem to call attention to police brutality and racial inequality. The protests grew into one of the most polarizing issues in sports, with U.S. President Donald Trump loudly urging the league to suspend or fire players who demonstrate during The Star-Spangled Banner. While he has been away from the playing field, Kaepernick has become an advocate for battling social and racial injustice. On Thursday, a person with knowledge of the conversations said that Kaepernick turned down a chance to join the fledgling Alliance of American Football, seeking US$20-million or more from the upstart league that pays its players US$225,000 over three seasons. Safety Reid recently re-signed with the Panthers for three years and more than US$22-million. He noted then that he got “fair-market value” after making just US$1.69million last season while playing with the Panthers. Officials with the players union said on Friday afternoon that they had just learned of the settlement and had no details.